Indian Coast Guard Recruitment 2019 – Apply Offline for Lascar, Engine Driver Posts: Indian Coast Guard (Indian Coast Guard) has advertised a notification for the recruitment of 18 posts of Lascar, Engine Driver vacancies. Eligible candidates can apply online from 16th Apr 2019 to 30th Jun 2019. Other details like age limit, educational qualification, selection process & how to apply for Indian Coast Guard Jobs are given below. 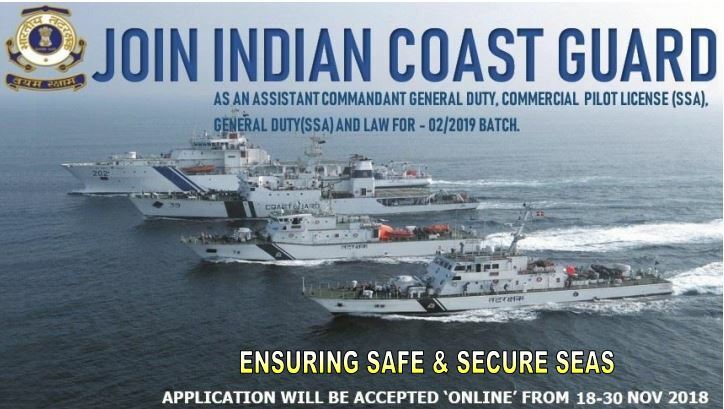 Interested Job Aspirants who are ready to apply for Indian Coast Guard 2019 Notification must possess the below-given Eligibility Details. Selected candidates will get PB-1 Rs.5200- 20200 + R1900 (GP) (prerevised) and Revised Pay Matrix Level 2, Rs.19,900 by the Recruiting Organization. Eligible and Interested Aspirants are requested to Download Application Form from Below link of joinindiancoastguard.gov.in Website and Submit it to the mentioned Address before the Last Date i.e., 30th Jun 2019.